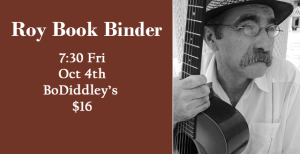 Long-time proponent of the rootsiest of American roots musics, Roy Book Binder counts among his inspirations and mentors two of the great old-time bluesmen-songsters, Rev. Gary Davis and Pink Anderson. Roy has been touring, recording, and teaching for more than forty years and has shared the stage with the likes of Arthur “Big Boy” Crudup, Homesick James, Sonny Terry, Doc Watson, Jorma Kaukonnen, Bonnie Raitt, and too many other artists to fit in this space. He’s more than a preservationist–he’s part of a living tradition.